I don't know about you, but I'm getting older, and I don't understand how it's happening so quickly. As a result, there are things that I'm learning I need to do to mark the passage of time. Time is like a cranky cat - you need to squeeze it awkwardly to your chest once in a while, even if it's going to scratch you and slink away anyway. I'm an extrovert, an interacter, and that is as true for time as it is for people. I want to celebrate holidays, follow sports seasons, and participate in seasonal rituals so that I can orient myself, stay right side up in a place without traditional seasons. So I throw barbecues, go pumpkin picking, and celebrate friends' birthdays (a la my last post) to have markers, big red X's in my mental calendar. Thanksgiving is a mastodon of memory (trademarking that). Every year I make my grandma's stuffing, the only time that I cook meat in our vegetarian house, and the only time I work myself up to sentimental tears while cooking. It's a bacon-studded bread bomb, and I dream about it starting in July. I can flip through my photos of Thanksgiving over the last seven years and see the same core group of friends together, albeit in different kitchens, with different outfits and different hairstyles, and sometimes different partners. It's comforting, especially when actual family is far away. On Saturday, Beth, Teppi and I flew down to LA for the day to celebrate dear sweet Beth's birthday. We called it Bethstravaganza, and it involved us waking up in the pre-dawn dark and getting ourselves to SFO hours before I would be normally awake on a weekend. There is nothing like getting up early on a Saturday to make a day feel special, like there's a secret that requires creeping out of bed and sneaking out of the house to uncover. Normally I include everyone and their mother (sometimes literally) when I plan something, but the complexity of the logistics required and the leap of faith entailed in taking a day trip that involves two flights meant that this ladies' day for ladies was limited. In persons, but not in scope, because we had a Full Day. 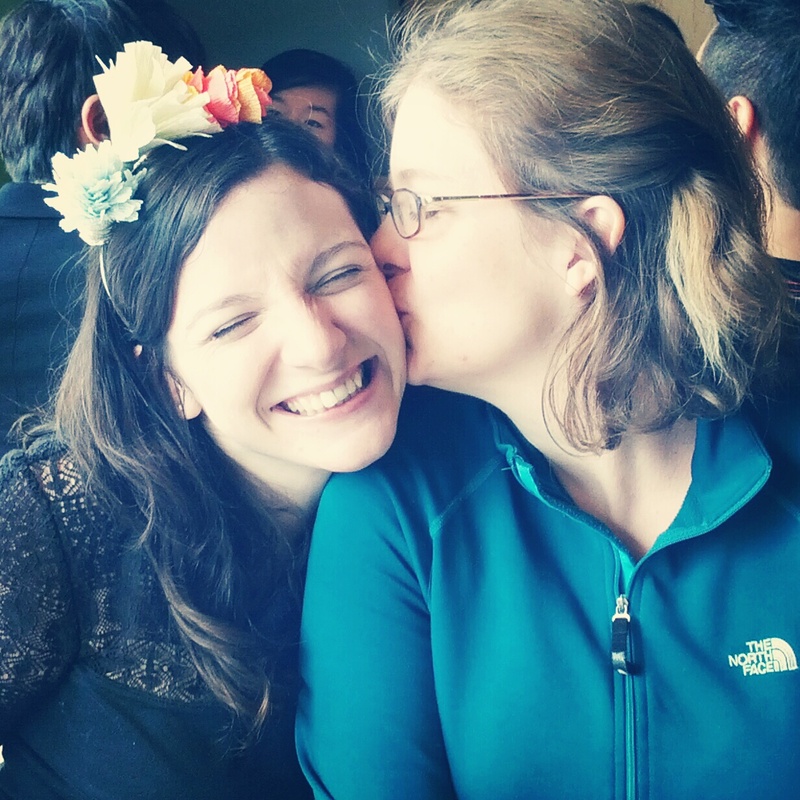 I brought along a homemade paper flower headband for Beth to wear, and wear it she did - to many compliments from strangers. When we arrived in LA, we picked up our rental car (a Mustang convertible!) and headed to the Santa Monica farmer's market. It was, by LA standards, a terrible day - mid 60s and occasionally drizzly. By San Francisco standards, however, it was perfectly lovely, and the rain didn't slow us down a bit. We didn't get to put the top down on the convertible as much as I would have liked (I had imagined a photoshoot of the birthday girl in the car, with the sunny beach as a backdrop), but it was still super fun to drive. And so sleek! At the farmer's market we picked up a few gorgeous dragonfruits and a protea for Beth, a nod to her wedding bouquet. We strolled Santa Monica, popping into shops, occasionally cooing over tiny trendy baby clothes. Ladies' day for ladies! We had a crazy and wonderful and busy and exciting and INDULGENT trip to Austin. I had looked forward to it for weeks - I was a bit burnt out, as evidenced by some grouchy posts on here - and I wondered if I was going to turn into a stressy mess instead of enjoying my vacation. But no, my friends - we wrung out maximum enjoyment. The excitement started two days before we left, when my brother wrote to me from the Hong Kong airport to say that his flight home from Perth to New York had been cancelled because of Hurricane (er, Superstorm?) Sandy, and Cathay Pacific could really only send him to San Francisco. He offered up his services as a catsitter while Mike and I were in Austin with my parents, which was sweet but misguided. Because thanks to a Gchat that lasted most of a day and on into the evening, we not only got him onto our flight to Austin two days later (this is why I hoard my miles), but we realized we could surprise the hell out of our parents AND got him a free VIP pass to the music festival going on while we were there. Like buttah. So Ian landed in San Francisco the next day without a single shred of knowledge about what timezone his body was in, the day after that we got on the plane to Austin, and a few hours after THAT we had a huge tub of queso and a giant stack of tortillas with us when we showed up at the rental house to surprise our parents with Ian's presence. My mom told us she had guessed he was with us when he suspiciously hadn't called her back after "dropping us at the airport", but my dad sat up in bed and said, "What the hell are you doing here? ", which was immensely satisfying. 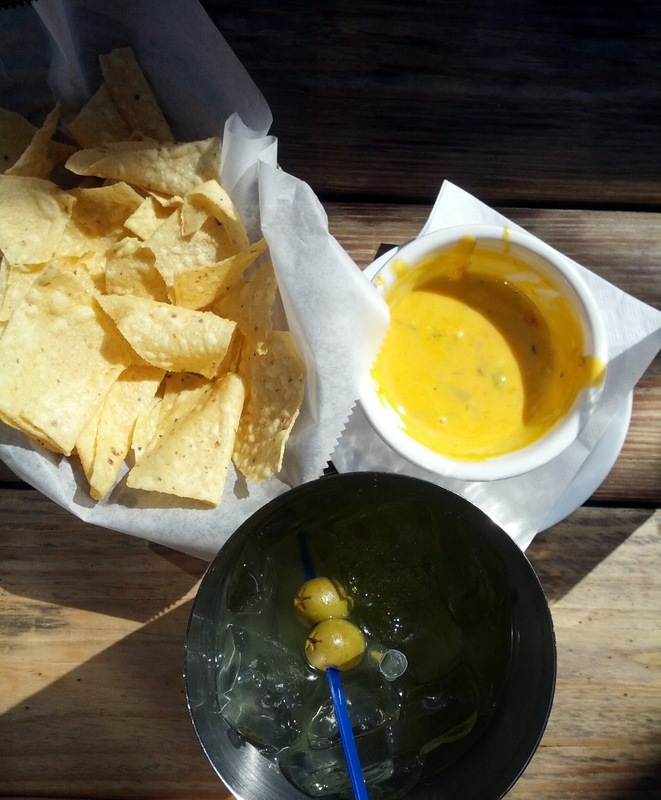 The first chips and queso are always the best. We settled into our little rental for the week and ate our way through Austin. Our first two days were picture perfect perfection. We went to Trudy's for brunch that first Friday, and introduced my parents to frozen margaritas (seriously), queso, and mexican martinis. We trolled the craft beer section at Central Market, dipped and sunned at Barton Springs, and had a luxurious early dinner at Uchiko. Divine. They even brought us a free dessert because I had tipped off the restaurant that this was my parents' anniversary dinner (though a few months late). After two of the best desserts I've ever had (the sweet corn sorbet and the fried milk) my parents headed home to crash, and Ian and I caught up with Mike at Fun Fun Fun Fest. I'm back from ten days in Texas, and am therefore experiencing the life shock that comes at the end of any vacation. It turns out I have to wake up early to go to work and can't have my first margarita of the day at 11 a.m. When we left San Francisco it was Halloween and Indian summer hot, and now it's The Holidays and chilly and dark at 5:30. On the plus side, we're now in the high holy days of butternut squash season. Hallelujah and amen. Sorry for not having pictures on the dishes below, but that's what happens when stuff is super tasty but not very pretty, or when I get drunk while cooking. Last night for dinner I made some grains - quinoa and teff - then prepared a squash "sauce" to dress therm. First I peeled, de-seeded, diced and roasted a small butternut shipped to me from my parents' garden. It went into a 400 degree oven with some oil and salt, and alongside it I tucked in an entire head of garlic. Post-roasting, I squeezed the garlic out of its casings and threw it in the food processor with some of the boil water from the grains, basil, olive oil and salt. Handful by handful I added the squash and spoonfuls of the grain water until it was a scoopable consistency - not runny but still soft. I piled the sauce on the grains and topped it all with toasted pine nuts. If I had had any feta or parmesan I would have sprinkled on some of that, and a bit of parsley as well. If you have any herb oil (I'm on a kick) you could drizzle that on too. My annual contribution to Friendsgiving is twice baked butternut squash, a dish that I feel very sure I made up on my own, which I simultaneously acknowledge is not super likely. I halve a large squash lengthwise, scoop out the seeds, and roast the heck out of it. I carefully scoop the flesh into a bowl, making sure to keep the squash skin intact. Into the bowl goes sauteed kale, garlic and onions, as well as other vegetables I think would be tasty (leeks, shaved carrots, chard). I mix in a cup of Greek yogurt and a few handfuls of shaved cheddar as well - if this is going to be my token healthy item on the table, I use reduced fat cheese and nonfat yogurt. I scoop the mixture back into the empty squash halves, top with some more cheese, and throw it back in the oven, ether to reheat (if it was made ahead of time) or to broil the cheese to crispy goodness. For dessert, I have, in a pinch (read: in Berlin where canned pumpkin apparently doesn't exist, only a nasty pickled variety that you should stop thinking about immediately) made Smitten Kitchen's pumpkin bread pudding with roasted butternut squash that we pureed, spiced and sweetened. It turned out beautifully.